In this chapter we will look for the reason why the Gods destroyed most living Creatures on Earth by a Great Flood, a disaster carefully planned by the Gods. As discussed in chapter 3 and 4, most of the 'players' who deserved their punishment are already know to us. After their descent to Earth, the Watchers indulged in earthly delights with their chosen 'wives', Through these unions were born Giant offspring named as Nephilim a Hebrew word meaning �those who have fallen�, which rendered in Greek translations as Gigantes, or 'Giants'. Another mistake made by 'The Church Fathers' and the Jews, was that they forgot to erase the verses that contains stories of Gods, Angels and Watchers. Maybe they could not translate these 'Scrolls' any other way. My question still remain 'what is left over of Monotheism?'. As the reader knows I'm sure that the Apocrypha and Pseudepigrapha books should be part of the 'new' Bible, but they are and will not be added because the stories in these books don't fit in the Monotheism theory of 'Christianity', Islam and the Jews. First of all we will read together the story of all these Creatures from the time Jared died until the time Noah went into the Ark. The next story we can find in many 'Scrolls' but I will use only three of them because otherwise this book would be to large and unreadable. Another argument is that in the 'Scrolls' that will be used is proof enough that my theory about the 'real' history of Ancient times is true. Genetic there was nearly no difference between Satana and his companions and the Daughters of Men this was also the same by 'The Watchers' (Children of Seth) and the Daughters of Men, otherwise they were unable to make children together. It is obvious that their Genetic structure was nearly the same because they were all 'Angels' and relatives at the beginning. 2. 'The Watchers' and the children of Cain' called Nephilim The offspring of this mingling was called 'Anakim'. Both were called Giants who are known with several names of which the most used is Anakim and Naphidim or Eljo. Gn:6:2: That the sons of God saw the daughters of men that they were fair; and they took them wives of all which they chose. 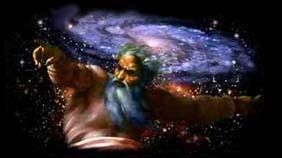 Gn:6:4: There were Giants (in Hebrew bible Nephilim) in the earth in those days; and also after that, when the sons of God came in unto the daughters of men, and they bare children to them, the same became mighty men which were of old, men of renown. The meaning seemed clear enough: there were two quite separate traditions entangled here, one concerning the fallen race known to the early Israelites as the Nephilim (mentioned elsewhere in the Pentateuch as the progenitors of a race of Giants called Anakim), and the other concerning the bene ha-Elohim, the Sons of God, who are equated directly with the Angels of God in Jubilees tradition and the Watchers in Enoch tradition. With other words: Nephilim, in Hebrew Bible Giants, is another word for 'Watchers', their offspring was called Anakim. The Children of Seth (God) were called Bene Ha-Elohim, their offspring was also called Anakim. Both offspring were Giants or, named in the Bible 'men which were of old, men of renown'. Gn:6:1: And it came to pass, when men began to multiply on the face of the earth, and daughters were born unto them, Gn:6:2: That the sons of God saw the daughters of men that they were fair; and they took them wives of all which they chose.Gn:6:3: And the Lord said, My spirit shall not always strive with man, for that he also is flesh: yet his days shall be an hundred and twenty years. Jasher 5:11 And the Lord granted them a period of one hundred and twenty years, saying, If they will return, then will God repent of the evil, so as not to destroy the earth. The meaning of this clause must be clear when we see what is written in Genesis 6:3 My spirit shall not always strive with man, for that he also is flesh: yet his days shall be an hundred and twenty years. even as in Jubilees 5:8 And He said 'My spirit shall not always abide on man; for they also are flesh and their days shall be one hundred and twenty years'. God meant that man was granted to come back of their evil ways for 120 years. The reader can see that the writers of the Bible made errors on purpose to have a way to explain the lifetime of modern mankind, or not on purpose, Nevertheless they made mistakes. Theologians are aware of this dilemma, and get around the problem by suggesting that the angels fell from grace twice, once through pride and then again through lust. It seems certain that the term Nephilim was the original Hebrew name for the fallen race, while bene ha-Elohim was a much later term, plausibly from Iran, which entered Genesis 6 long after its original compilation. In spite of the contradictions surrounding Genesis 6, its importance is clear enough, for it preserved the firm belief among the ancestors of the Jewish race that at some point in the distant past a Giant race had once ruled the earth, from the time of Jared until the time of David, the second King of Israel, with other words the offspring of the Anakim existed until historical times. Chapter 5 1 And it came to pass when the children of men began to multiply on the face of the earth and daughters were born unto them, that the angels of God saw them on a certain year of this jubilee, that they were beautiful to look upon; and they took themselves wives of all whom they chose, and they bare unto them sons and they were Giants. The same story as in the Bible. Chapter 5. 2 And lawlessness increased on the earth and all flesh corrupted its way, alike men and cattle and beasts and birds and everything that walks on the earth all of them corrupted their ways and their orders, and they began to devour each other, and lawlessness increased on the earth and every imagination of the thoughts of all men (was) thus evil continually. 3 And God looked upon the earth, and behold it was corrupt, and all flesh had corrupted its orders, and all that were upon the earth had wrought all manner of evil before His eyes. You can imagine that when the offspring of the daughters of men and the Angels of God were Giants, then their 'elders' must have been Giants too. Chapter 7. 21 from fornication and uncleanness and all iniquity. For owing to these three things came the flood upon the earth, namely, owing to the fornication wherein the Watchers against the law of their ordinances went a whoring after the daughters of men, and took themselves wives of all which they chose: and they made the beginning of uncleanness. 22 And they begat sons the Naphidim, and they were all unlike, and they devoured one another: and the Giants slew the Naphil, and the Naphil slew the Eljo, and the Eljo mankind, and one man another. 23 And every one sold himself to work iniquity and to shed much blood, and the earth was filled with iniquity. 24 And after this they sinned against the beasts and birds, and all that moves and walks on the earth: and much blood was shed on the earth, and every imagination and desire of men imagined vanity and evil continually. Noah told his children, after the flood, why the Flood had been brought to the Earth. Here we can read also about the Nephilim (Naphidim) even as in the Bible, even we found a new name for the Giants, namely the Eljo. Even the Giants (Naphidim, Naphil, Eljo) sinned against the beasts and birds, You can imagine that the enormous number of stories in Myths and Legends about half Men-half Beast and half Men-half bird could be true, and it was true, they lived indeed a long ago and even until historical times (see later the story of Demons and Monsters). Chapter 6 1 And it came to pass when the children of men had multiplied that in those days were born unto them beautiful and comely daughters. 2 And the angels, the children of the heaven, saw and lusted after them, and said to one another: 'Come, let us choose us wives from among the children of men and beget us children. 7 And these are the names of their leaders: Samlazaz, their leader, Araklba, Rameel, Kokablel, Tamlel, Ramlel, Danel, Ezeqeel, Baraqijal, Asael, Armaros, Batarel, Ananel, Zaqel, Samsapeel, Satarel, Turel, Jomjael, Sariel. 8 These are their chiefs of tens. In Enoch we see the most extensive version of the same story. In chapter 4 we have already discussed that at least three of the Angels, children of the heaven were close relatives of the last three earth-fathers. Chapter 7 1 And all the others together with them took unto themselves wives, and each chose for himself one, and they began to go in unto them and to defile themselves with them, and they taught them charms and enchantments, and the cutting of roots, and made them acquainted with plants. The Angels are named here 'Children of the Heaven' and they were with 200 and lived on top of the mountain (and we found its name *HERMON') where Jared and his children (The children of God) lived, So, these Angels lived once near 'The Garden of Eden' as mentioned one of the four SPACE COLONIES of the Gods on Earth (mount Hermon, the mount of the East, mount Sinai and mount Zion). In chapter 8 and 9 we will read that the Sumerian Anunnaki came to Earth to do the work for the leader Gods in groups of 200, with a total of 600. The similarity with Enoch is obvious. Chapter 7. 2 And they became pregnant, and they bare great giants, whose height was three thousand ells: 3 Who consumed all the acquisitions of men. 4 And when men could no longer sustain them, the giants turned against them and devoured mankind. 5 And they began to sin against birds, and beasts, and reptiles, and fish, and to devour one another's flesh, and drink the blood. 6 Then the earth laid accusation against the lawless ones. 3000 ells? *, 1 ell is about 0.30 meter so these Giants were indeed Giants their length was about 900 meters, the Greek translation speaks of 300 cubits (1 cubit is 0,45 meter) so even in the Greek tradition these Giants had the respectable length of 135 meters. * here is mentioned the 'old' ell which is about 0,3 meter. This is not the only place where is spoken of their enormous length, as we will see in later chapters. 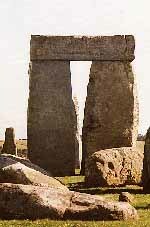 In most Myths, Legends and Sages it speaks of Giants with a length of about 6 to 90 meters. (Cyclops with one eye was one of these Giants but there were many more). In verse 5 we read a dazzling story that the 'Nephilim' began to sin against birds, beasts and reptiles and even they began to eat their flesh and drink their blood. Reading this story makes it more understandable what is written in Legends and Myths where is told that the most 'strange' beings once existed on Earth. 1. The Bible talks about 'The Children of Seth' or 'The Children of God' who went down from the mountain, FALLEN ANGELS. 2. The book of Jubilees talks about 'The Angels of the Lord and the Angels of God', the ANGELS and WATCHERS. 3. The books of Enoch only talks about 'The Angels, children of the heaven' and the WATCHERS. We found 'All Fallen Angels' where also the Bible is talking about and their offspring were Giants, Anakim, Demons and Monsters. There are countless stories of Fallen Angels and Gods of the Bible, and also in many myths and legends from all over the world. Many of these Gods were worshipped in ancient times and they were abundant as well as exceedingly mysterious. Playing the harlot and whoring after other Gods brought destruction to early man. In chapter 4 I have already more then necessary proved that these three different Angels were one and the same and we will call them from now on 'The Nephilim' If you have read the story carefully you know that all Creatures that sinned were Angels, but I will use the word Angels meaning Fallen Angels. Gn:6:5: And God saw that the wickedness of man was great in the earth, and that every imagination of the thoughts of his heart was only evil continually. Gn:6:6: And it repented the Lord that he had made man on the earth, and it grieved him at his heart. Gn:6:7: And the Lord said, I will destroy man whom I have created from the face of the earth; both man, and beast, and the creeping thing, and the fowls of the air; for it repenteth me that I have made them. Gn:6:8: But Noah found grace in the eyes of the Lord. 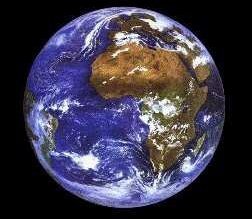 Gn:6:11: The earth also was corrupt before God, and the earth was filled with violence. Gn:6:12: And God looked upon the earth, and, behold, it was corrupt; for all flesh had corrupted his way upon the earth. Gn:6:13: And God said unto Noah, The end of all flesh is come before me; for the earth is filled with violence through them; and, behold, I will destroy them with the earth. That's all the Bible tells about 'The Nephilim'. In Jubilees and Enoch we can find more information. Chapter 5 4 And He said that He would destroy man and all flesh upon the face of the earth which He had created. 5 But Noah found grace before the eyes of the Lord. 6 And against the angels whom He had sent upon the earth, He was exceedingly wroth, and He gave commandment to root them out of all their dominion, and He bade us to bind them in the depths of the earth, and behold they are bound in the midst of them, and are (kept) separate. 7 And against their sons went forth a command from before His face that they should be smitten with the sword, and be removed from under heaven. 8 And He said 'My spirit shall not always abide on man; for they also are flesh and their days shall be one hundred and twenty years'. 9 And He sent His sword into their midst that each should slay his neighbour, and they began to slay each other till they all fell by the sword and were destroyed from the earth. 10 And their fathers were witnesses (of their destruction), and after this they were bound in the depths of the earth for ever, until the day of the great condemnation, when judgment is executed on all those who have corrupted their ways and their works before the Lord. 11 And He destroyed all from their places, and there was not left one of them whom He judged not according to all their wickedness.12 And he made for all his works a new and righteous nature, so that they should not sin in their whole nature for ever, but should be all righteous each in his kind always. 13 And the judgment of all is ordained and written on the heavenly tablets in righteousness even (the judgment of) all who depart from the path which is ordained for them to walk in; and if they walk not therein, judgment is written down for every creature and for every kind. 'And against 'The Nephilim' whom He had sent upon the earth', In The Scrolls of Jubilees is clearly spoken about 'The Watchers' (so named in Enoch). 'And against their sons' (Anakim), here is clearly spoken about the offspring of 'The Nephilim' who also muted with the daughters of men. Then finally comes verse 12 were we can read: 'And he made for all his works a new and righteous nature'. In the same verse we can also read that this new creation shall be judged as written down in the heavenly tablets. Finally the prediction of the 'Earth Fathers' was fulfilled and the Gods created a new 'race' HOMO SAPIENS, our real Ancestors. Now we know that Homo Sapiens was created shortly before or shortly after the Flood. We will see that the Flood took place about 32,358 years BC. (see chapter 13). Thus HOMO SAPIENS was created about 34,000 years ago (32,000 BC). We discussed the punishment of the 'Nephilim' in the book of Jubilees but the book of Enoch is also very clear about this judgment and as we will see the Gods and the 'Good Angels' were extremely wrath to their leaders. Chapter 8 1 And Azazel taught men to make swords, and knives, and shields, and breastplates, and made known to them the metals of the earth and the art of working them, and bracelets, and ornaments, and the use of antimony, and the beautifying of the eyelids, and all kinds of costly stones, and all coloring tinctures. 2 And there arose much godlessness, and they committed fornication, and they were led astray, and became corrupt in all their ways. 3 Semjaza taught enchantments, and root-cuttings, 'Armaros the resolving of enchantments, Baraqijal (taught) astrology, Kokablel the constellations, Ezeqeel the knowledge of the clouds, Araqiel the signs of the earth, Shamsiel the signs of the sun, and Sariel the course of the moon. And as men perished, they cried, and their cry went up to heaven . . . In chapter 4 we could read about Genun and how he was instructed by Satana and his companions to make weapons. In the book of Enoch the 'Nephilim' brought forth hidden knowledge of which the God's had forbidden to make known to Mankind, Why?, we will see that later. And again we can read about the uncle of Lamech, 'Baraqijal' (the brother of his father Methuselah) who taught Mankind the knowledge of Astrology. And God was especially angry to Azazel, one of 'Nephilim', we can imagine that is because Azazel was the Leader of the 'Nephilim' and he had the knowledge of weapons and making war. In case of keeping this secret for Mankind he, in contradiction, learned Mankind to make weapons and make war. And Azazel and the other 'Nephilim' revealed the eternal secrets which were (preserved) in heaven. Chapter 10 1 Then said the Most High, the Holy and Great One spake, and sent Uriel to the son of Lamech, and said to him: 2 'Go to Noah and tell him in my name 'Hide thyself!' and reveal to him the end that is approaching: that the whole earth will be destroyed, and a deluge is about to come upon the whole earth, and will destroy all that is on it. 3 And now instruct him that he may escape and his seed may be preserved for all the generations of the world. 4 ' And again the Lord said to Raphael: 'Bind Azazel hand and foot, and cast him into the darkness: and make an opening in the desert, which is in Dudael, and cast him therein. 5 And place upon him rough and jagged rocks, and cover him with darkness, and let him abide there for ever, and cover his face that he may not see light. 6 And on the day of the great judgment he shall be cast into the fire. 7 And heal the earth which the angels have corrupted, and proclaim the healing of the earth, that they may heal the plague, and that all the children of men may not perish through all the secret things that the Watchers have disclosed and have taught their sons. 8 And the whole earth has been corrupted through the works that were taught by Azazel: to him ascribe all sin. 9 ' And to Gabriel said the Lord: 'Proceed against the bastards and the reprobates, and against the children of fornication: and destroy [the children of fornication and] the children of the Watchers from amongst men [and cause them to go forth]: send them one against the other that they may destroy each other in battle: for length of days shall they not have. 10 And no request that they (i.e. their fathers) make of thee shall be granted unto their fathers on their behalf; for they hope to live an eternal life, and that each one of them will live five hundred years. 11 ' And the Lord said unto Michael: 'Go, bind Semjaza and his associates who have united themselves with women so as to have defiled themselves with them in all their uncleanness. 12 And when their sons have slain one another, and they have seen the destruction of their beloved ones, bind them fast for seventy generations in the valleys of the earth, till the day of their judgment and of their consummation, till the judgment that is for ever and ever is consummated. 13 In those days they shall be led off to the abyss of fire: and to the torment and the prison in which they shall be confined for ever. 14 And whosoever shall be condemned and destroyed will from thenceforth be bound together with them to the end of all generations. 15 And destroy all the spirits of the reprobate and the children of the Watchers, because they have wronged mankind. 16 Destroy all wrong from the face of the earth and let every evil work come to an end: and let the plant of righteousness and truth appear: and it shall proof a blessing; the works of righteousness and truth' shall be planted in truth and joy for evermore. But in spite of the great sins the 'Nephilim' made, the Gods told the Angels that their offspring, the Anakim, still would live for 500 years but they should lose their eternal life. It seems that the Gods didn't have absolute power over 'The Nephilim' otherwise they would have destroyed them directly, together with their offspring. In the 'age' prediction lies concluded that the Flood should not come directly or that several 'Nephilim' and 'Anakim' should survive the Flood. We will see later in this chapter that a great amount of the Children of The Anakim' still lived in the time of Moses, Joshua, Saul and David. Though they were degenerated in thousands of years and were only a 'shadow' of their powerful forefathers.In the next chapters we will see that most of the offspring of the 'Anakim' were Kings and they ruled over the human population after the flood. Most of them were worshipped as Gods and Demigods. Also in the book of Enoch is spoken of a 'new' period with a 'new' creation because in verse 16 the Gods predicts 'the 'plant' of righteousness that will appear'. In chapter 6 and 7 we will see that here is spoken of the 'New' creation called HOMO SAPIENS. The 'Anakim' and the daughters of men, The Giants, 'produced' all kinds of Demons and Monsters, from the knowledge of their 'Fathers' the 'Nephilim' and they created what ever they liked and so were born the most 'Strange Creatures' that ever existed on Earth. The mating of humans and those who descended resulted in some extraordinary hybrid Creatures. Bringing forth many Evil Spirits from within physical bodies. These demonic hybrids began to completely corrupt and destroy the human race, they sinned not only with the daughters of men, they began to sin against the animals, beasts, birds, and reptiles, bringing forth the half human half animal creatures, which are so widely known throughout ancient cultures and civilizations and many were worshipped as gods. A time when ALL FLESH was corrupted it's ways. And after a time, resulting in the Great Flood / Deluge, ..'the end of all flesh'. Which also brought an end to inner breeding between nations. Many of these 'children', Creations were also of Giant stature and many were barbaric and cruel, after these beings inhabited earth for a time they corrupted their ways even further by mating with the animals, bringing forth the incredible creatures we view in ancient myths and legends. Many of them were worshipped as Gods. In most Scrolls and ancient legends we see there were beings of a half human half fish nature; DAGON (half human and half Lion) was once worshipped as a god by the Philistines. In later chapters I will come back with other stories about Giants, Demons and Monsters from all over the world. Can you imagine what strength these Giant 'Nephilim' had when their body was to 100 meters tall. Can you imagine that for such Creatures it's nearly no problem to carry stones and build Giant structures, keep also in mind that they had 'Tools' we can't imagine, and were able to carry or transport stones with a weight thousands of tons, If your answer is Yes than we have solved the problems where scholars are still wrestling with today. 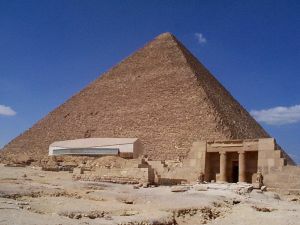 The Giant 'Nephilim' were the builders of most Pyramids in Egypt, and NOT the Pharaohs as said today. 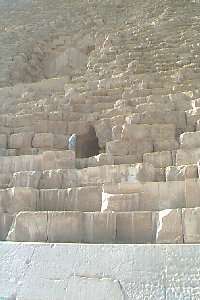 The same conclusion can also be drawn for most great structures build all over the world, on Land and (at present time) under Sea level.Proof of that we can find when we look at the Pyramids of Egypt of which Scholars are aware that, by name, the Pyramid of Cheops can't be build by human beings, even with our most modern machines it is constructed in a way of which we have still no knowledge at present time. 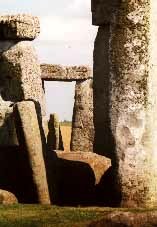 The Great structures and Building of witch we can find fragments today, The Pyramids of Egypt and many other all over the world, The Temples in India, Mexico and other places in South America, Cities like Tiauanacu in Bolivia, Mohenjo-Daro and Harappa in India and last but not least Stonehenge in England (see picture), the Megaliths (Menhirs) in Bretagne France, Hunnebeds in The Netherlands (see picture) and Germany, Baalbek in Lebanon (see picture) are build by Giants and not by human beings (Homo Sapiens), our real ancestors. 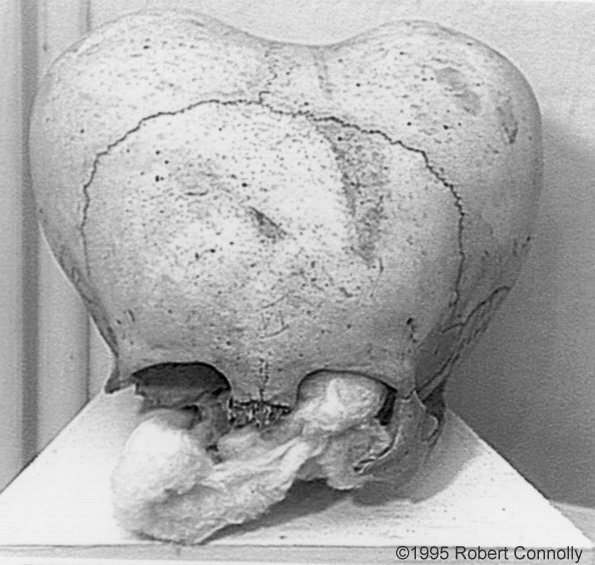 More proof of the above we can find in Museums in the form of giant tools and even giant skulls of which the origin is unknown. 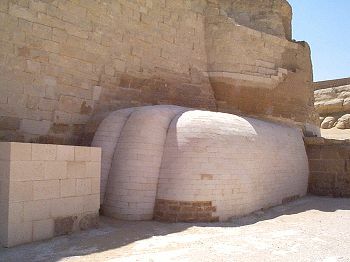 This is probably the largest cut stone in the world. It is found about half a mile away from Acropolis at Baalbec, where similar, thought lightly smaller stones build the fundament on which the Acropolis stands. 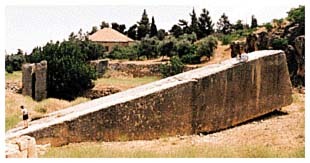 This stone is 68 ft (22 m) long and roughly 14 ft (3,3 m) square. Its weight is about 1,200 tons. 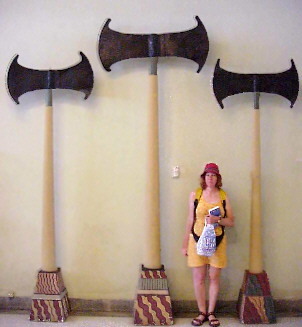 Giant Axes fond in Sumer. Bagdad Museum Iraq. The enormous stones that were used by their builders to made these structures, most are from ten to thousands of tons in weight each, can not be cut out of the mountains and transported over (most enormous distances) by human beings. Even at present time we are not able to build such structures, even with our most advanced machines. I mentioned already that the Giant 'Analim' died out slowly and their 'skills' degenerated in time, there was only a small piece left of the original strength and length compared to their ancestors, the first Giants with their enormous strength and length could have had a length of 10-100 meters. (keep in mind the length that is given in Enoch, 3000 ells). It sounds unbelievable but we know that this is the truth. The 'Anakim' were quite tall and fierce. They were living almost over all the Middle-East, Europe, America and Asia before the destruction of the flood, there was a remnant of them after the flood which possibly inhabited Ammon, Moab, Edom and Bashan with it's fortified city with high walls and gates with bars, just to name a few who yet inhabited earth after the flood. Reasons behind the continued wars and great slaughters with total destruction in Biblical times. Was this in any way connected with the people trying to control Mother Nature through and with these entities and their children? Of course it was. The destruction caused by the great flood, the end of the so called 'golden' age was a result of the increasing evil done by the 'Anakim' and their children. From the forbidden knowledge of those who came down. We know that evil and corruption increased with their appearance on Earth before the Flood but we have seen already that even after the Flood they still existed until historical times. There are countless stories of visitors and or entities from the universe throughout our ancient history to date. Sacred books and folklore of widely separated lands all tell of Gods who visited Earth wrapped in clouds or conveyed by fiery chariots. In the Bible we can find a large amount of stories regarding the Anakim and their 'degenerated' offspring called the children of Anak, Emims and other names. Dt:3:11: For only Og king of Bashan remained of the remnant of giants; behold his bedstead was a bedstead of iron; is it not in Rabbath of the children of Ammon? nine cubits was the length thereof, and four cubits the breadth of it, after the cubit of a man. Dt:1:28: Whither shall we go up? our brethren have discouraged our heart, saying, The people is greater and taller than we; the cities are great and walled up to heaven; and moreover we have seen the sons of the Anakims there. Dt:2:10: The Emims dwelt therein in times past, a people great, and many, and tall, as the Anakims; Dt:2:11: Which also were accounted giants, as the Anakims; but the Moabites called them Emims. Dt:9:2: A people great and tall, the children of the Anakims, whom thou knowest, and of whom thou hast heard say, Who can stand before the children of Anak! Jos:11:21: And at that time came Joshua, and cut off the Anakims from the mountains, from Hebron, from Debir, from Anab, and from all the mountains of Judah, and from all the mountains of Israel: Joshua destroyed them utterly with their cities. Jos:11:22: There was none of the Anakims left in the land of the children of Israel: only in Gaza, in Gath, and in Ashdod, there remained. Jos:14:12: Now therefore give me this mountain, whereof the Lord spoke in that day; for thou heardest in that day how the Anakims were there, and that the cities were great and fenced: if so be the Lord will be with me, then I shall be able to drive them out, as the Lord said. Jos:14:15: And the name of Hebron before was Kirjatharba; which Arba was a great man among the Anakims. And the land had rest from war. The Emims were as tall as the Anakims and belonged also to the Giants, and they were Children of the Anakims and Moses referred that these children of the Anakims still lived on Earth in the days of Joshua and later still in the days of David. (Goliath) The Children of the Anakims (Anak) were as tall as their fathers but the degeneration of the Giant race, in length and in strength was obvious decreasing in those days because they were destroyed in a great number during the time of Joshua, Saul and David. Nm:13:32: And they brought up an evil report of the land which they had searched unto the children of Israel, saying, The land, through which we have gone to search it, is a land that eateth up the inhabitants thereof; and all the people that we saw in it are men of a great stature. Nm:13:33: And there we saw the giants, the sons of Anak, which come of the giants: and we were in our own sight as grasshoppers, and so we were in their sight. Even the Children of Anak (Anakim) were still of a great stature, still so great that Joshua and his army were like grasshoppers before them, so even after a long period of degeneration the Children of the Anakim were still Giants in their eyes. A strange detail is that is written that these sons of Anak eats the inhabitants of that land, so they were also Cannibals. Also Egypt was accounted a land of Giants in ancient times. (the Children of Ammon). It's obvious that these Giants also build large structures and walls. 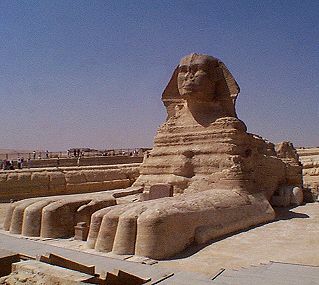 They were the builders of the Great Pyramid and the Sphinx. 2Sm:21:18: And it came to pass after this, that there was again a battle with the Philistines at Gob: then Sibbechai the Hushathite slew Saph, which was of the sons of the Giant. Chr:20:4: And it came to pass after this, that there arose war at Gezer with the Philistines; at which time Sibbechai the Hushathite slew Sippai, that was of the children of the giant: and they were subdued. 1Chr:20:5: And there was war again with the Philistines; and Elhanan the son of Jair slew Lahmi the brother of Goliath the Gittite, whose spear staff was like a weaver's beam. 1Chr:20:6: And yet again there was war at Gath, where was a man of great stature, whose fingers and toes were four and twenty, six on each hand, and six on each foot and he also was the son of the giant. 1Chr:20:7: But when he defied Israel, Jonathan the son of Shimea David's brother slew him. 1Chr:20:8: These were born unto the giant in Gath; and they fell by the hand of David, and by the hand of his servants. 1Chr:21:1: And Satan stood up against Israel, and provoked David to number Israel. Satan?, (He suddenly came back to Earth in those days, warned by his offspring ? and he grew angry to David and his servants because they destroyed Satan's offspring. Even Satan was still on Earth at that time again proof that not ALL Nephilim were destroyed during the Flood. 1Sm:17:4: And there went out a champion out of the camp of the Philistines, named Goliath, of Gath, whose height was six cubits and a span. 1Sm:17:5: And he had an helmet of brass upon his head, and he was armed with a coat of mail; and the weight of the coat was five thousand shekels of brass. 1Sm:17:6: And he had greaves of brass upon his legs, and a target of brass between his shoulders. 1Sm:17:7: And the staff of his spear was like a weaver's beam; and his spear's head weighed six hundred shekels of iron: and one bearing a shield went before him. 1 CHRONICLES 20: 4-8 And it came to pass after this, that there arose war at GEZER with the Philistines; at which time Sibbechai the Hushathite slew SIPPAI, that was of the children of the GIANT: and they were subdued. And there was war again with the Philistines. 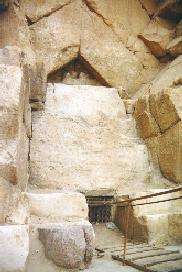 Do you want more proof that the Children of the Giant 'Anakim' still lived on Earth in the time of Saul and David?. * The children of 'The Nephilim' and the daughters of Man (the children of Cain) were the Giant 'Anakim' with enormous strength and length. (from 10 to 100 meters tall) and their lifetime was about 500 years. * These Giants were the builders of the enormous structures all over the word, including the Pyramids of Egypt, Stonehenge in England and many more structures and ancient cities. * The prediction of 'The Earth Fathers' was fulfilled, shortly before or after the flood, with the creation of a new 'race', namely 'HOMO SAPIENS', our real ancestors (see later in chapter 6 and 7). * The offspring of The Nephilim' and the daughters of men, 'The Anakim' Giants, 'created' all kinds of Demons and Monsters, they had the knowledge from their 'Fathers' the 'Nephilim' to create what ever they liked and so were born the most 'Strange Creatures' that ever existed on Earth. * Can you imagine why I don't belief in the theory that all living people on this earth are children of ADAM and EVE ?. People who still belief that story are unwilling to read the Bible and other books as historical books. * When we read ancient history carefully we should have seen that almost ALL nations who were ruled by Kings made often War against each other. This phenomenon is left over from the time above discussed. Keep in mind that these Kings mostly were offspring of the Anakim who learned to kill from their fathers the Giant 'Anakim'. * I belief that this is the reason we live with our 'primitive based historical thoughts' in the 21st century. Why are we still fighting all kinds of wars all over the world, most of them regarding religious differences and thoughts, (Catholics against Protestants, Islam against Christians etc.) It should be better to unite our knowledge and seek for the real history of mankind. When we use our knowledge and forget religion we will soon 'awake' and see that we still fight each other at present time due to the difference in religious thoughts. So far we did not learn from our history. We could know better but are unwilling to use our intelligence. I can't understand that we still do not learn from our ancestors NOT to worship these beings as Gods, as even in present time is still common. I am sure that if we unite our cultures and knowledge and Scholars could closely and peacefully look for the real history in places where it is now impossible, due to political reasons (Iraq, Tibet, India and Pakistan etc), we should soon find the truth. Let us open our eyes and minds and let us search together for the real history of our Home planet and ancestors then to use a lot of time to fight each other with dogma's within our religions. Consider that the Pope did announce the Year 2000 as the Year of consideration. I think it had been better to announce that year as Year to rewrite the Bible including at least, the book of Jubilees and the books of Enoch, but I am sorry to announce that this will not happen because of the reason I mentioned already 'Monotheism'. Our church fathers are aware of the above stories but are unwilling to change whatever because they should lose their power over religious people. They continue to deceive the religious people even they know better and still held the lock on all secret books and scrolls that are stored in the Vatican and other places. They forget one thing, once in the future when mankind have learned to use their culture and brains they will pay the penalty. I hope that future will come very soon. So far we have only read one history namely the story of the Bible, Jubilees and Enoch, but as I mentioned already there are many more stories. Even the Bible exists in several versions, (Jewish, Bibles of Protestant, Roman Catholic, and Eastern Orthodox Christianity, each differing in some of their contents. In the next chapters we will look at the Flood and the Generations after the Flood and the Creation of Human (Homo Sapiens).